Bloggers attended a highly enjoyable laser tag event organized by TravelBook.ph and LazerXtreme. Entitled “You’ve Been Tagged: TravelBook.ph x LazerXtreme Blogger Event,” it was held last March 26, 2017 at Market! Market! Mall in Taguig City. As part of TravelBook.ph’s goal to establish stronger relationships with both affiliated and non-affiliated bloggers, the event started with an icebreaker where attendees had the chance to know each other by introducing themselves and the blogs they represent. The icebreaker was then followed by a series of short talks from Mr. Jude Aniñon, LazerXtreme Branch Manager, about LazerXtreme; Ms. Pinky Librada, Officer-in-Charge of TravelBook.ph’s Business Development Team, about TravelBook.ph; and Ms. Pia Bernaldo, TravelBook.ph’s Business Development Officer, who encouraged bloggers to join the company’s affiliate program by presenting its benefits such as a high commission rate, free getaway trips, exciting events, and many more. Attendees were divided into four teams—Blue, Red, Green, and Yellow—for the laser tag. To win, a team must acquire the highest score as they shoot their opponents with a laser gun within the game platform. Each body part corresponds with a certain score, and the opponent’s laser deactivates for three (3) seconds every time they are hit. Players can also score extra points every time they shoot enemy bases. At the end of the game, which lasted for 20 minutes, Blue Team won, which composed of Nikko Madrilejo, Bedalyn Aguas (represented by her son during the game), Bae Milanes, Mikhail Rollan, and Facebook Photo Contest winner Ron Paolo Luna. 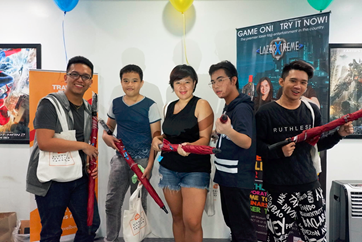 The winners took home LazerXtreme umbrellas and TravelBook Affiliate Program merchandise items. This event is a collaborative effort of TravelBook.ph and LazerXtreme to provide quality leisure services to the Filipino market. The Holy Week is coming and if you want to reflect and getaway for the long weekend, book your trips with TravelBook.ph below!